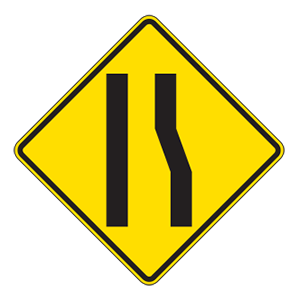 Warning signs prepare drivers for upcoming road conditions and hazards and are usually yellow and black. This sign tells drivers that a lane is ending and that they should prepare to allow traffic to merge safely. Be ready to use your horn. Allow a larger following distance. When following a motorcyclist, allow for at least a three- to four-second following distance. Motorcycles can stop quickly and following them too closely endangers your life and that of the motorcyclist. If the motorcyclist should fall, you need extra distance to avoid the rider. The chances of a fall are greatest on wet and icy roads, gravel roads, and metal surfaces such as bridges, gratings, and streetcar or railroad tracks. Regulation signs regulate traffic speed and movement, displaying rules which drivers must obey. 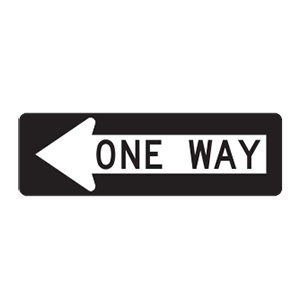 This sign tells drivers the direction in which they must drive when turning onto a one-way street. Only vehicles displaying special plates or parking placards for persons with disabilities may park in spaces reserved for them by an official sign. A parking space marked by a "Reserved Parking for Persons with Disabilities" sign may only be used by vehicles that display Persons with Disabilities license plates, Disabled Veteran license plates, and/or disabled parking placards. It is unlawful to drive alongside a motorcycle in the same lane. You must never attempt to share a lane with a motorcyclist, even if it looks like there is enough room to do so. Motorcyclists need to have a full lane width to be able to maneuver safely. A driver must proceed slowly through the intersection. A driver must stop and then proceed when the way is clear. A driver must stop and then proceed when the signal changes to a green light or green arrow. A driver may turn in the direction that the red arrow is pointing. Unless a posted sign indicates otherwise, a traffic signal displaying a red arrow means that drivers must come to a full stop and remain stopped until a green light or green arrow appears. When driving under icy or snowy conditions, which driving technique will help drivers avoid crashes? Add extra weight to their vehicles to improve traction. Get off the highways as quickly as possible. Engage the four-wheel drive on their vehicles. Reduce their speed and increase their following distance. Reduce your speed when roads are snow-covered or icy. Doing this and increasing your following distance are the most important techniques for avoiding crashes under snowy or icy conditions.